The Ad Hoc Committee voted 45 in favour to 6 against with 8 abstentions, for the appointment of a commission to carry out simultaneous investigation in the Western and Eastern zones of Germany to see whether conditions in those areas were such as to make possible the holding of "genuinely free and secret elections". 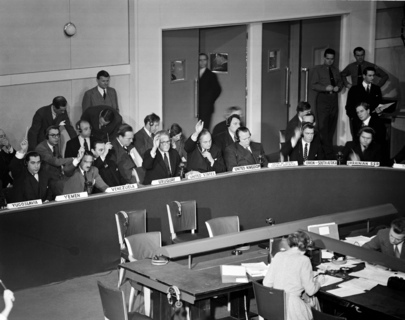 Voting for the resolution are, left to right: Dr. Adnan Tarcici, Yemen, Dr. Eduardo Plaza, Venezuela, Mr. Gilberto Pratt de Maria, Uruguay, Mr. John Sherman Cooper, U.S., Sir Gladwyn Jebb, U.K.; Mr. Y.A. Malik, USSR, voted against. December 1951.